June 22, 2016 – In the first billion years of Earth’s history, the planet was bombarded by primordial asteroids, while a faint Sun provided much less heat. A Southwest Research Institute-led team posits that this tumultuous beginning may have ultimately fostered life on Earth, particularly in terms of sustaining liquid water. “The early impacts caused temporary, localized destruction and hostile conditions for life. 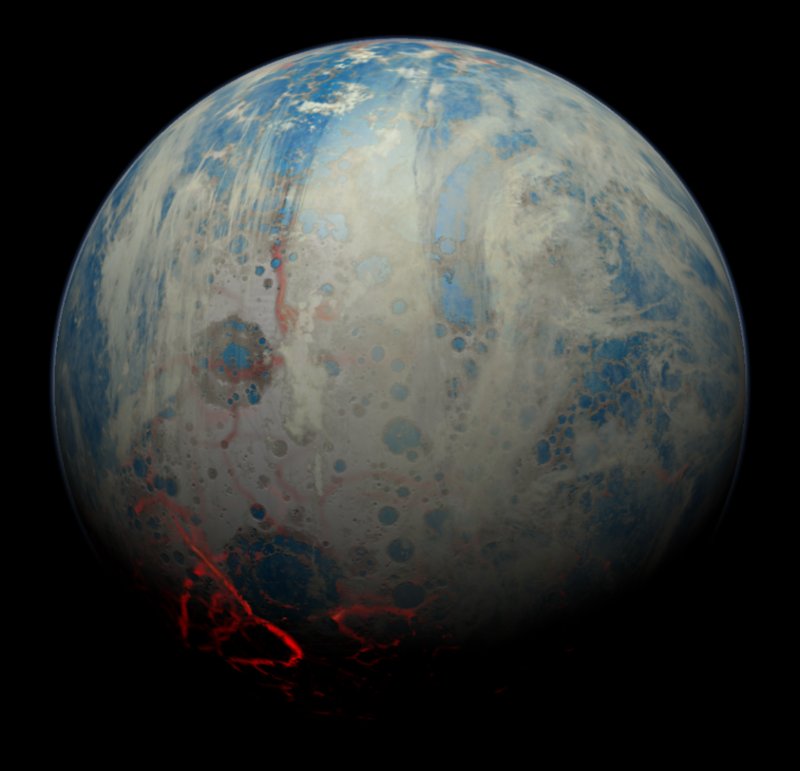 But at the same time, they had a long-term beneficial effect in stabilizing surface temperatures and delivering key elements for life as we know it,” said Dr. Simone Marchi, a senior research scientist at SwRI’s Planetary Science Directorate in Boulder, Colorado. Marchi is the lead author of a paper, “Massive Impact-induced Release of Carbon and Sulfur Gases in the Early Earth’s Atmosphere,” recently published in the journal Earth and Planetary Science Letters. The paper addresses a major problem, one of the outstanding mysteries in the history of the solar system and Earth — the faint young Sun paradox. “Atmospheric and surface conditions during the first billion years of Earth’s history are poorly understood due to the scarcity of geological and geochemical evidence,” said Marchi. However, ancient zircon crystals in sedimentary rocks provide evidence that our planet had liquid oceans, at least intermittently, during this earliest period. His team created a new model for impact-generated outgassing on the early Earth, showing how a resulting greenhouse effect could have counterbalanced the weak light from the infant Sun enough to sustain liquid water. The findings could be key to understanding how life started on Earth despite the faint young Sun and havoc caused by collisions. Studies of other stars, as well as theoretical modeling, have shown that Sun-like stars begin their life about 20 to 30 percent fainter in visible wavelengths than the Sun is at present. They gradually increase in luminosity over time. “Today Earth is in the ‘Goldilocks zone,’ where liquid water can exist on its surface,” said Marchi. Referencing the fairy tale about the three little bears, the Goldilocks zone is an orbit around a star where it’s not too hot, nor too cold, for liquid water. Liquid water is generally considered a key ingredient for life. When the Sun was much fainter, the Earth with its present atmospheric composition would have been frozen solid. If the oceans were frozen, life may not have formed. The most straightforward explanation would be a massive atmospheric greenhouse effect, from either carbon dioxide or methane, or both. Previous work has speculated that volcanic outgassing or impact-vaporized materials could have released greenhouse gases. Marchi’s team proposes a novel, more efficient mechanism. As the planet was pummeled by primordial asteroids — some larger than 100 kilometers in diameter — impacts would melt large volumes of rock, creating temporary lakes of lava. These pools of lava could have released large quantities of carbon dioxide to the atmosphere. This research was partially funded thorough an Exobiology Grant and supported by Solar System Exploration Research Virtual Institute. SSERVI, a virtual institute of international partnerships, enables cross-team and interdisciplinary research, designed to push the boundaries of science and exploration. Located at NASA’s Ames Research Center in Moffett Field, California, SSERVI is funded jointly by the agency’s Science Mission and Human Exploration and Operations Mission directorates at NASA Headquarters in Washington, D.C.